Surface rust on the underside of a car and on brake rotors is harmless, but rust on bodywork is definitely a cause for concern. Older vehicles made from steel rust quickly if the metal is exposed to air. Newer vehicles can rust quickly too. Modern bodywork is made from aluminium which is highly resistant to corrosion and much more resilient than the steel panels found in older cars. However, it isn’t immune to weathering or oxidisation caused by pollutants. Because of this, you should wash your car to remove these pollutants periodically. You don’t need to go mental. Hosing down your car with a pressure washer will remove salts and chemicals just fine and it only takes 10 minutes – perfect for winter. In the summer, you’ll find that salts are less of an issue and tar spots become a bug bear. Tar spots are more likely in the summer because the road is softer in warm weather and releases its chemicals. Remove tar spots every month using a tar remover and microfibre. As your car gets driven it’ll pick up stone chips. This is perfectly normal, and at first, they are totally harmless. Over time however the exposed metal underneath oxidises and a layer of rust forms over the top. This makes repairing stone chips a touch more difficult because the rust needs to be removed before the chip can be filled in. Therefore, we recommend repairing stone chips quickly and preferably the day you spot them. To do this, you’ll need a touch up primer stick and a touch up paint stick. You can buy the touch up paint directly from your local dealership or a place like Halfords – just make sure the paint code matches up or else you’ll have discoloured spots on your bonnet. The primer should be automotive grade. You’ll also need ethanol wipes to clean out the chip and create a nice surface for the paint to adhere to. If you do find rust spots on your car, treat them early to prevent further damage. If you notice a rust spot and leave it, the rust will spread because that’s what it does. It’ll also eat away at the metal over time, which can create a hole. 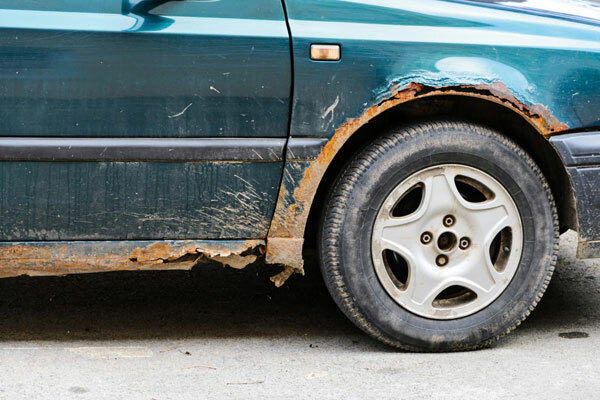 Thankfully, you can treat minor rust spots at home. You’ll need 180 grit, 320 grit and 400 grit sandpaper to remove the rust and a rust repair kit (these can be found online for around £20). For the finish, you’ll need primer, touch up paint and a high-quality blue painter’s tape for masking. Alternatively, you can leave the job to the professionals which is what we recommend. This is also necessary for major rust spots. If you live in a seaside town, salt from the sea will cause your car’s metal bodywork to rust prematurely. The best way to prevent this is to garage your car, but where this isn’t possible a waterproof car cover is an excellent alternative. You can also reduce the amount of salt and road chemicals that get kicked up onto your car by installing mud guards. These are fitted on each wheel arch and significantly reduce the amount of rubbish that gets kicked up the car. They’re ideal for use in winter but can be left on year-round to keep your car clean. You can pick up universal mudguards (that you cut to size yourself) online for a few quid. Check out eBay. If you notice rust on your car, be it in the boot, under the body or on an arch, inspect the rust with your hands. If it feels very soft, like you could push your finger through it, it’s very old rust that will need removing and new metal welding in. If it’s solid, the rust is likely less than a millimetre thick. A professional bodyshop will sand this down to the healthy metal, fill it and paint it. You won’t be able to tell there was rust there. However, please keep in mind that some areas of a car are very difficult to repair to an as new standard. Bumpers with rust at the bottom, for example, will probably need to be replaced. Some fenders and arches are also best replaced.